The Paderno 42573-31 food mill has a rotating arm for hand operation and a bar crossing the bowl to keep the blade positioned for grinding. Offering different types of textures, three sieves come with the unit. Tabs help the mill sit still on the edge of a container so that all strained food can fall directly into it. Although it is not as durable as stainless steel, its tinned steel construction is sturdy and has a long service life. 3-lb. maximum production per min. 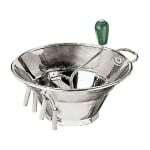 Food mill, #3, 12-1/4" diameter, 9-3/4" H, 5 quart capacity, 3 lbs per minute, three cutting plates, 1/16", 3/32", 5/32", 5 quart capacity, tinned steel. "This product is great. It is large enough to handle a big batch of potatoes or tomoatoes. Easy to use and a snap to clean up. Not sure how I ma..."
"This product is great. It is large enough to handle a big batch of potatoes or tomoatoes. Easy to use and a snap to clean up. Not sure how I managed without it, quickly becoming one of my favorite kitchen gadgets."